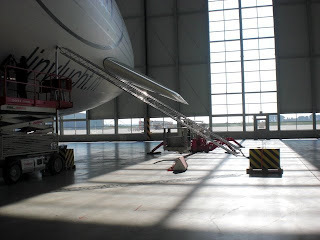 The airship is attached to the Combi Dock 1 via steel poles that brace her against the sides of the dockship and the floor. This picture shows some of the poles being attached to the airship. The one attached to the concrete block is just for tie down in the hangar.